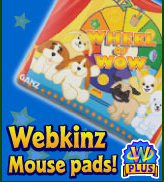 What better way to play in Webkinz World than using an official Webkinz mouse pad! There are four great designs – one is perfect for you! 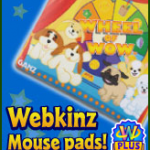 Each mouse pad comes with a Feature Code that unlocks an exclusive framed poster for your pet’s room featuring the same art as your mouse pad! Pick up your favorite for you and your pet to enjoy!